I've been water bath canning for many years, but it has a lot of limitations. For at least a decade, I've wanted a pressure cooker. More than anything else, I'd love to be able to pressure can green beans. This year for Christmas, Paul and the boys gave me an All American pressure cooker. It was my only present from them, and way over our usual budget, but I do think it will pay for itself over time. I confess the thing is a little intimidating, even with all the safety features. But I was eager to try it. I watched the intro video twice. Then Paul butchered a couple of roosters for me. It seems some folks pack chicken raw, but after consulting a couple of friends and websites, I decided to cook mine first. The added bonus to this is getting broth as well. I packed the meat in pint jars with just a little broth. It was super cold outside, but Paul was nice enough to oversee the pressure canner for me while I kept an eye on the bone broth process indoors. We haven't tried them yet, but I'm hoping the meat will be flavorful and tender. 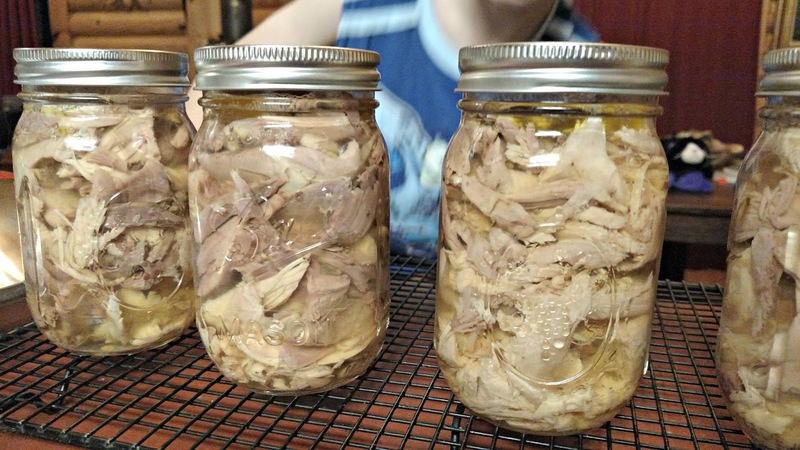 Roosters can be kind of tough and stringy, but pressure canning is supposed to help with that. 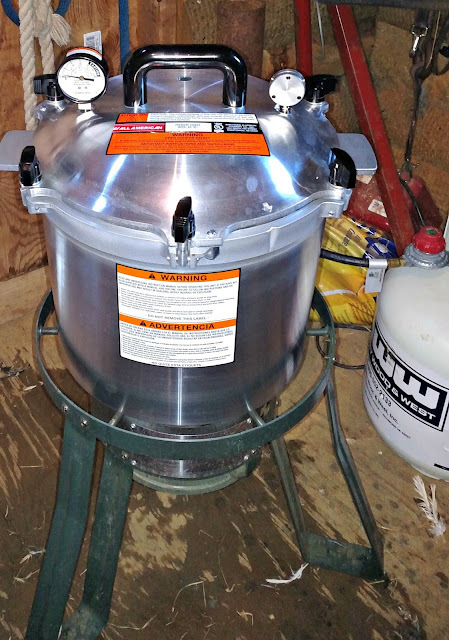 Readers, have you ever used a pressure canner? I gave one as a gift and hope to see some results. Holy cow that thing looks like a nuclear fission container! Growing up we had to old classic with the one valve on top. You changed the pressure by flipping the thingy on top to a different hole. It made a nice sound when cooking. Wow, that is the best one you can get, at least as far as I know. I found an old used one but still have to work on it and put a jiggler on it as it was made before they started using them. The biggest drawback to my other cookers is the rubber gaskets, I have to mess with them to stop leaks even with new ones after a year. They just don't make rubber gaskets like they used to I guess. Glad you survived, green beans will be easier! We used one a while back for a couple of years. I think it is the same one you have. It worked but then we kinda stopped canning due to focus on other things. A lot of what we do is building skills then making sure we polish those skills from time to time as we focus on other things. We still can with the wash each year but haven't went back to pressure canning. Nope! It scares the crap out of me! You did it outside? Did you just fill everything up inside and bring the whole pot outside to the burner? I think canning green beans would be great! We typically make dilly beans, which the kids enjoy. Not to mention canning all of the leftovers - soup, chili and the like, that would be nice! I can my chicken and turkey the same way you did. I like the added bonus of the broth. What a great Christmas gift! My pressure canners are of the cheaper variety with gaskets, but I use them the year around. Having this way to preserve food is essential to me and the possibilities are endless. Enjoy! good job! i'm intimidated by pressure cookers! The All American canner is a good investment. We bought one in 1973 from Montgomery Wards for $40 and it still works fine. For years I canned with just the pressure gage, then a few years back my husband bought a pressure weight for it. What a relief...I can now tell the pressure from another room and don't have to 'stand over' it continually. It makes the process much easier for me. Wish I had thought to keep track of all the jars of food I have processed with that canner. The last thing I canned was venison this fall. Such a great gift, Lisa. I know you'll really enjoy using it. I've never had one, but my mom used hers a lot when we were growing up. It's a great way to preserve food. my mother cooked chicken in the pressure cooker all the time. it was the tastiest i've ever eaten and i still miss it to this day. What a great gift. I had an old fashioned pressure cooker that I used years ago. It always scared me! I don't do any canning but I agree with you cooking the meat first. Enjoy your new toy! Enjoy! Many years ago I helped my Granny can and swore I'd never do it myself. These days I, too, dream of home-canned green beans... frozen always seem to have an 'off' texture. Nope to the pressure cooker. Nope to the rooster. But I enjoy reading about how you do this...and why. I have indeed! My old one was ruined last year when the stove malfunctioned and overheated ... fortunately the smoke detector went off before the fire spread past the stovetop. That IS an intimidating pressure cooker, Lisa. But your post helped me identify how my parents, in fact, did can peppers we grew in our garden when I was a kid" "water bath canning". My All American Canner (purchased from the USA because they are not available here in Europe) has paid for itself time and time again. I had an ordinary pressure cooker years ago, so fortunately I was familiar with the way in which the steam vents is such a furious manner when I first used my canner. I would never put raw meat into canning jars though,I always cook it first, either by slow cooking it in a pot full of water and vegetables, or wrapped in foil in the oven of our wood burning stove. 2 - I always make sure of heating the meat up to a high temperature and keeping it there for at least 20 minutes to make sure that any possible 'nasties' have been killed off. 3 - I never eat cold meat straight from the canning jar. Good luck with your canner. I prefer these canners to water bath canning because I don't like putting jars into deep boiling water. I got all fired up a few years back and was going to learn to can. Almost without exception, everyone I talked to on line recommended the pressure cooker your family got you. They made a good decision. I never got off the ground with canning, for two reasons. One, I found out that because I don't garden, it would cost me more to buy vegetables and can them than to just buy them off the shelf at the grocery. Second, our county has a beautiful brand new cannery for the citizens to use, and all the needed supplies are there. If you don't want to do it yourself, you just say what you want in what size cans, and high school girls can the stuff for you. Cost is minimal. My mom has one. I sadly don't. I was offered my grandma's. But I don't have room for everything. I sadly declined. I've never done this. Some days I've been barely cooking! What stress! I have never tried one. What a nice gift. I hope you are very pleased with it. I love visiting your blog and learning new things. I have a young neighbor with a 1 yr old and another baby due in June. I share with her everything I learn on your blog!!! She grows all their fruits/veggies in a dirt-less tower. I admit I am afraid of pressure cookers. Probably because my mom used one when I was growing up and she had to watch it so closely and I heard all about explosions that could happen. The top would start to rattle and she would tell us to leave the kitchen. Are you using yours outside? We used to have one,,, years ago..